BET YERAḤ (Heb. בֵּית יֶרַח), large Canaanite city on the shore of the Sea of Galilee extending over a tell of approximately 50 acres, from the site of the present-day moshavah *Kinneret , to the outlet of the *Jordan River from the lake near *Deganyah . This location is based on the Jerusalem Talmud (Meg. 1:1, 70a) which speaks of two autonomous cities surrounded by walls, Bet-Yeraḥ and Ẓinabri ( *Sennabris ), in the vicinity of the Sea of Galilee. An additional reference is found in Bekhorot 51a, which states that the Jordan River "began" at Bet Yerah. Inasmuch as Sennabris is usually identified with Ḥaẓar Kinneret, it is probable that Bet Yeraḥ was situated on the site known to the Arabs as Khirbat al-Karak. Although not mentioned in the Bible, the name points to an ancient Canaanite settlement whose deity was a moon god. Excavations were conducted there in 1944–46 by the Jewish Palestine Exploration Society and, from 1949, by the Department of Antiquities and the Oriental Institute, University of Chicago. 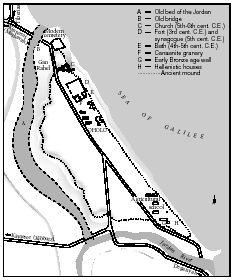 Map showing the site of the Canaanite city of Bet Yeraḥ in relation to the modern Oholo. After P. Delougaz and R.C. Haines, A Byzantine Church at Kirbat Al-Karak, 1960.
erection of a brick wall, the first of Bet Yeraḥ's fortifications, was followed by the building of mud-brick houses and in the 29th century B.C.E. (Early Bronze Age II), stone houses made their appearance. A tomb from this period found at moshavah Kinneret contained gold ornaments in the style of Asia Minor. The settlement reached its zenith in the Early Bronze Age III (26th–24th centuries B.C.E. ), when a large granary, 3,936 sq. ft. (1,200 sq. m.) in area, was constructed to the north of Bet Yeraḥ, indicating that at that time it was already the center of a large region of irrigated farmlands. The pottery of this epoch is light red or red-black burnished ware (a type common in Syria and Asia Minor) and its presence is apparently to be attributed to influences of northern peoples who penetrated through trade or invasion. In the Middle Bronze Age I the settlement was concentrated in the southern part of Bet Yeraḥ. No settlement existed there after that for about 1,500 years until the Persian period; to this period belong several graves found there. The city's location in ancient times east of the Jordan, on a narrow tongue between the river and the Sea of Galilee, necessitated building the main fortifications on the southern side. Here, where the Jordan now flows, the city lacked natural defenses in ancient times. The settlement at Bet Yeraḥ flourished again in the Hellenistic period. It has been identified with Philoteria, a Ptolemaic center, captured by *Antiochus III in 198 B.C.E. and also mentioned among the cities conquered by *Alexander Yannai (according to George Synkellus, 1:559). Remains uncovered from this period include a stone wall with vaulted openings and several houses, some with floors, plastered and painted walls, and windows overlooking the lake; numerous Rhodian stamped jar handles were also discovered. In the early Roman period, a large Roman structure, covering an area of 105 × 59 ft. (32 × 18 m.), was erected on the ruins of the Hellenistic houses on the south. A large rectangular fort built of dressed masonry with towers at its corners was constructed on the northern part of the tell in the third century C.E. From this period there are several reports of a mixed Jewish-gentile population at Bet Yeraḥ (TJ, Meg. 1:1, 70a). After the Bar Kokhba war, priests of the Haaziah family settled there. The verse "Naphtali is a hind let loose" (Gen. 49:21) was interpreted by rabbis of the time as referring to Bet Yeraḥ, the territory of which was "entirely irrigated" (Gen. R. 98:22). The statement in the Jerusalem Talmud (loc. cit.) "The city was destroyed and became the possession of gentiles" also alludes to some event which occurred in the third century at Bet Yeraḥ or in its vicinity. In the fourth and fifth centuries, the fort seems to have been abandoned and its southern wall was used as the northern wall of a bathhouse. Excavations have shown that the bathhouse, the water for which was conducted through earthenware pipes from the aqueduct of *Tiberias , had a central hall with a circular pool in the center and heated rooms. In the fifth century, a synagogue was built within the fort. It was basilical, with an apse oriented to Jerusalem, and was one of the largest contemporary synagogues in the country, 121 × 72 ft. (37 × 22 m.). Its foundations have survived as well as part of its mosaic floor depicting a citron tree, a man and a horse (possibly a representation of the story of Mordecai and Haman), and also the base of a column incised with a seven-branched candelabrum. North of the synagogue, a Christian church was built, basilical in form, with a central hall and two aisles; an atrium containing a well lay on its west side. The church had been enlarged to the north by a baptistery with a mosaic pavement dating from 529 C.E. Bet Yeraḥ was resettled in the seventh century after having been destroyed during the Persian or Arab invasion, but it was abandoned shortly afterward and reoccupied only in recent years. In 1945 an agricultural secondary school for the settlements of the Jordan Valley was built south of the tell and in 1949 Oholo, a conference and study center in memory of Berl *Katznelson , was erected north of it. Oholo opened in 1957 on the initiative of Ben Zion Yisreeli of Kevuẓah Kinneret, a leading personality of the labor and kibbutz movement. It houses courses for soldiers after their discharge; a teachers' seminary, principally for students hailing from Middle Eastern countries who intend to teach in immigrant villages and development towns; and a field school of the Society for the Preservation of Nature. Maisler et al., in: IEJ, 2 (1952), 165–73, 218–29; P. Bar-Adon, in: Eretz Israel, 4 (1956), 50–55; Albright, in: AASOR, 6 (1926), 27ff. ; idem, in: JPOS 15 (1935), 200; Sukenik, in: JPOS, 2 (1922), 101ff. ; P. Delougaz and R.C. Haines, Byzantine Church at Khirbat al-Karak (1960).